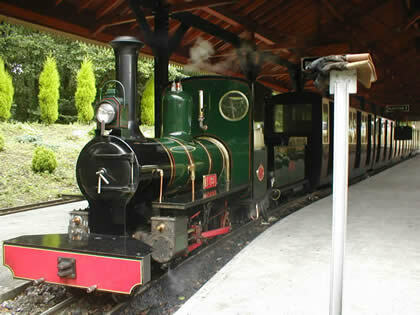 This railway opened using equipment from the Suffolk Wildlife Park, some of which had been originally used at Rudyard Lake. Since opening, the railway has been extended twice, the most recent extension opening in 2006 to the new Riverside station. 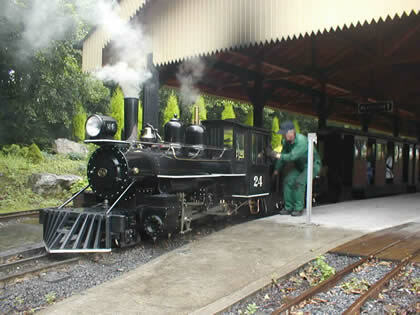 The railway now provides transport for visitors between the main car park and the leisure park.Riverside station is adjacent to the main car park for Trago Mills and has 3 tracks which end in a turntable. From here, trains cross a road by an automatic level crossing and run alongside a river, before crossing the river. The railway then joins the original circuit, which loops around and across itself several times – at one point there are 6 parallel tracks, all on different levels. The second station “Trago Central” has two platforms and is situated in the Leisure Park area. After leaving “Trago Central” trains pass over an impressive 23 pier viaduct and pass the workshop & engine shed before heading back to Riverside station, where the locomotive is turned and run round the train. BSR Page was last updated on the 4th February 2009 with navigation bar links changed.